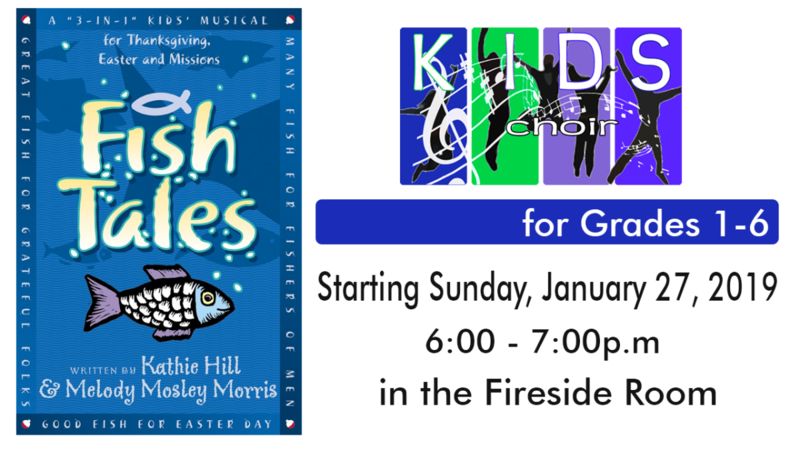 Kids Choir for Grades 1 - 6 begins Sunday, Jan. 20, 2019, 6 - 7 p.m. in the Fireside Room. We will begin preparing for our Spring Musical Drama which will be presented on Sunday, May 5, 6:00 pm. 1. All Kids Choir members must have a 2018-19 Child/Student Registration Form completed and on file. If you have not yet filled out this form, please use this link to sign up for Kids Choir and please make sure you check the “Kids Choir” box option on the form. 1-6 Grade with Miss Paula and Miss Theresea in the Fireside Room. Questions? Ask Pastor Brad or Miss Paula.